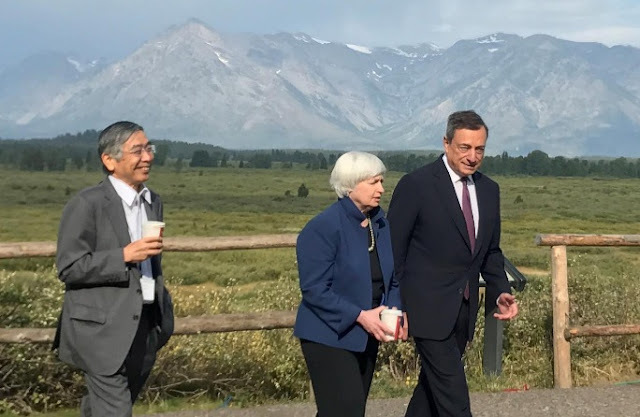 FILE PHOTO: Governor of the Bank of Japan Haruhiko Kuroda (L to R), United States Federal Reserve Chair Janet Yellen and President of the European Central Bank Mario Draghi walk after posing for a photo opportunity during the annual central bank research conference in Jackson Hole, Wyoming, August 25, 2017. WASHINGTON - The leaders of the world’s top central banks who risked trillions of dollars and their reputations to rescue the global economy are now set to walk off stage at a time when the lingering effects of the crisis, evolving technology and a combustible political landscape will challenge their successors. 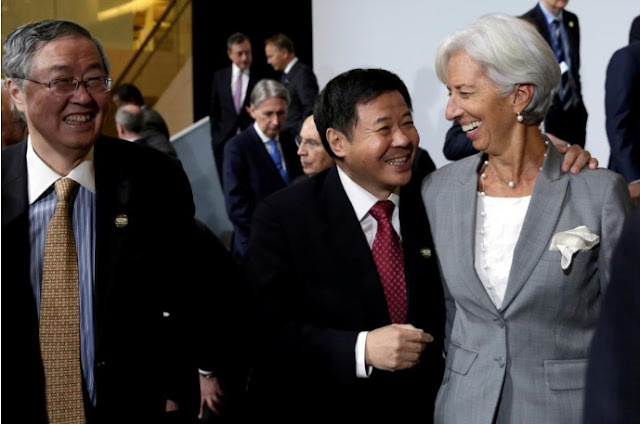 Along the way they deployed open-ended central bank asset purchases, introduced negative interest rates, salvaged the euro zone from a possible fracture, and steered China, now the world’s second largest economy, toward more openness and currency reforms. Yellen, a top Fed official since 2004, both helped craft the crisis response and steered the Fed’s to a more conventional policy. FILE PHOTO: Chinese Vice Finance Minister Zhu Guangyao (C) hugs ternational Monetary Fund (IMF) Managing Director Christine Lagarde as People's Bank of China Governor Zhou Xiaochuan (L) smiles after G-20 finance ministers and central bank governors family photo before a plenary session during the IMF/World Bank annual meetings in Washington, U.S., October 12, 2017. Zhou’s successor will face an immediate choice of how aggressively to continue the policy transition toward market-based norms, and how to resolve a suspected mountain of bad debt on provincial and corporate books. Bank of Japan board member Sayuri Shirai said the Fed’s smooth transition from the era of near zero rates and bond buying to one of steadily tighter monetary policy was a testament to Yellen’s steady hand and good communication. Whoever Trump names to run the Fed, for example, will have a clear “gradual” interest rate path and a balance sheet reduction plan to rely on, at least at first. Draghi is also expected to reduce the ECB’s bond buying and take the initial steps toward more conventional monetary policy over the remainder of his term. The leaders of the world’s top central banks who risked trillions of dollars and their reputations to rescue the global economy are now set to walk off stage at a time when the lingering effects of the crisis, evolving technology and a combustible political landscape will challenge their successors.